It takes effort to tear a living twig off a bush, unraveling the tenacious fibers within the pith. By contrast, I like to think that the quick, clean snap of a desiccated stick lets me give its brittle wood a second life as an artifact. 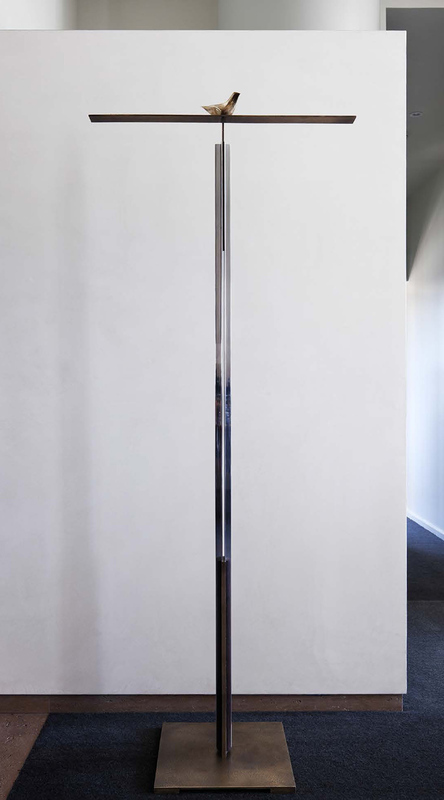 The simplest stick, reduced to its graphic essence, forms a straight line. Upended, it evokes the Axis Mundi, a mythic link between earth and heaven, or the vertical stipes (post) of a Roman cross. 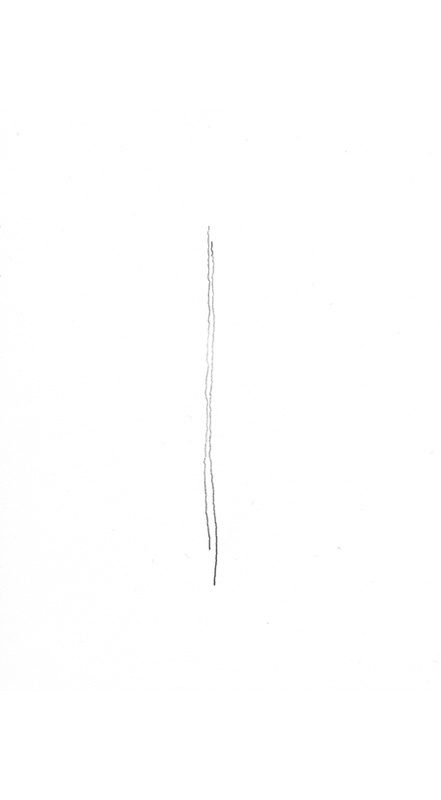 Each copy of this book is inscribed with a unique version of Stick that I have drawn in pencil. On country walks I often gather fallen twigs and branches that speak to me. I came across this Y-shaped oak fragment in the forest surrounding a Massachusetts pond. 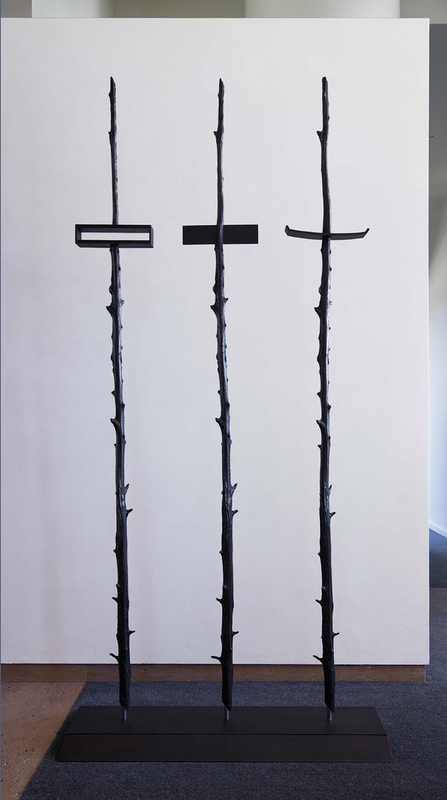 The splayed arms of the fork, the taut weightiness of the upright trunk, and the scraps of bark adhering like a vestigial shroud—together they imply a crucifix conceived without standard iconography. The grace of birds in flight, as well as their dignity on perches, explains why humans have often viewed them as embodiments of deities, angels, and messengers. This birdlike glass vessel comes from ancient Phoenicia. 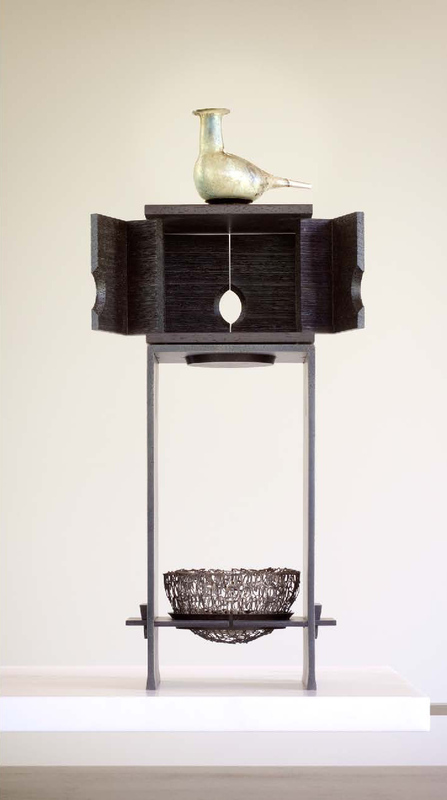 The “nest” of a wire bowl is inscribed with words from a Tibetan prayer: “Do not abandon me…” When the doors of the two-tier box are open, they suggest the horizontal span of a cross. The martyrdom of many early Christian saints occurred on a T-shaped, or tau (after the Greek letter tau), cross, rather than the four-armed Roman, or Latin, cross commonly associated with the crucifixion of Jesus. Here, a pair of aluminum T beams bolted around a bronze T with porelike indentations composes a metaphor for mankind’s attachment to vulnerable flesh. The bird finial signals a divine presence. 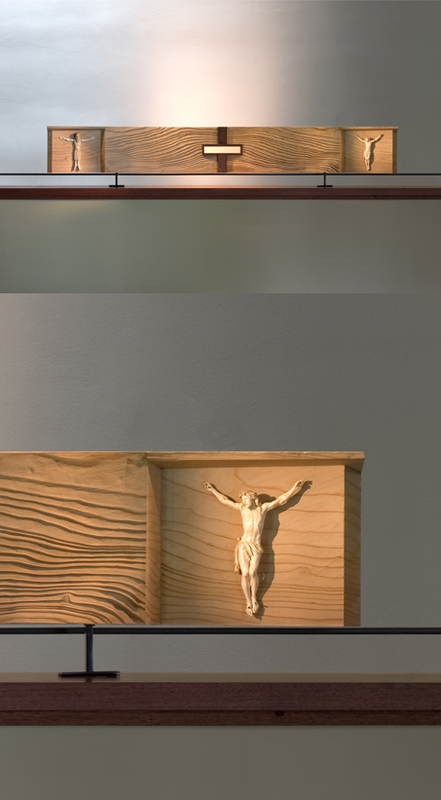 Wenge-wood grips accommodate a bearer’s hands when the cross is raised from its base for processional display. Knowing my fascination with natural “found” objects, my brother-in-law passed along this massive tree root. I gently reworked the sinuous contours of the wooden arc to enhance the effect of hair framing a human face. Although the veil I created with metal mesh connotes femininity, the entire visage may be perceived as female or male, or as an amalgam of both genders. The bronze cross rising behind the veil emerges from a pedestal where a golden cup awaits offerings. Mount Calvary (from the Latin calvaria, meaning “skull”), was the site of the Crucifixion. A diptych, frequently used for Christian altarpiece paintings, consists of two hinged panels. This piece incorporates two antique carvings that represent Jesus on the Cross (while also acknowledging the thieves crucified to either side of Him): a version in bone (left), believed to be of 17th-century Spanish origin, and one in ivory, probably late 18th-century French. The central oblong void represents infinity. The shafts of all three crosses were cast in bronze from the same tree trunk, and yet each incorporates a unique distinguishing symbol (from left): an infinity rectangle, for God the Father; a bar piercing its support, for the Son; and uplifting wings, for the Holy Spirit. 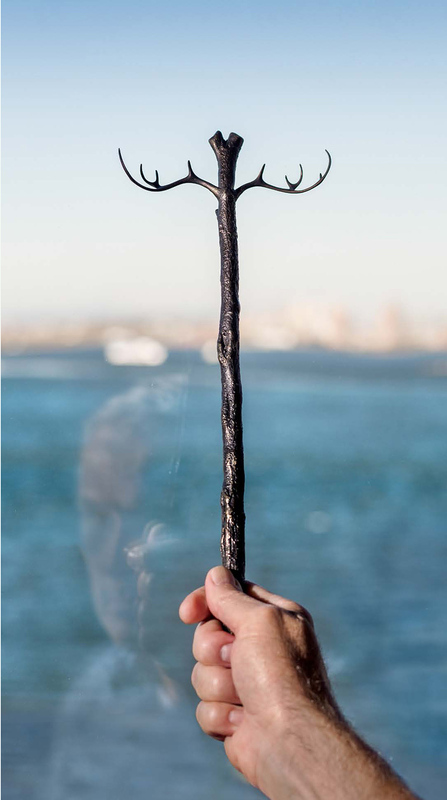 These crosses are meant to be carried during Lenten services, when the concept of the Trinity looms large. Otherwise, they might stand together in a chapel as a sculptural triad. The namesake of this piece died suddenly in an accident while still a young man. 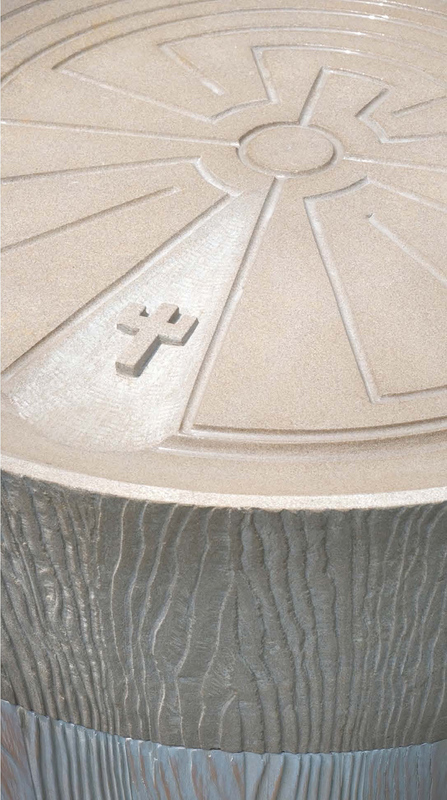 Resting on a sandblasted cedar base, the limestone crown has a shallow mandala (a circular cosmic symbol in both Eastern and Western iconography) carved into its top. A cruciform figure appears at the entrance to a maze adapted from the pattern of an American Indian basket. Rainwater submerges the mandala maze. Then, as evaporation dries the stone’s raised surfaces, liquid caught in carved indentations emphasizes the labyrinth, before seeping down the grooved wood grain. 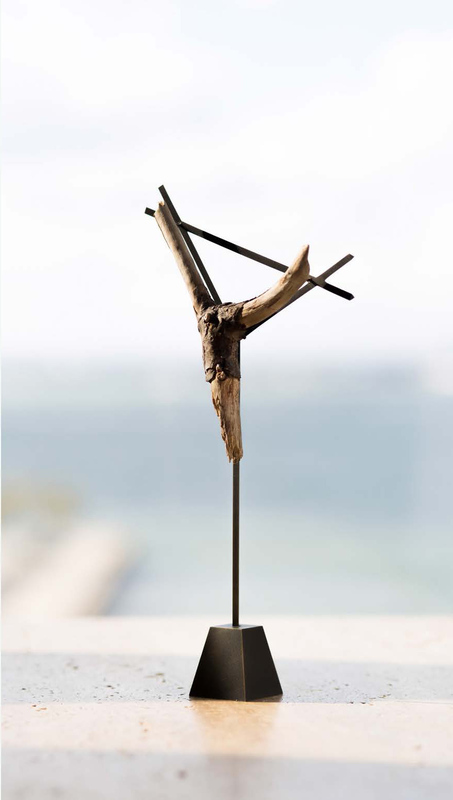 The open forked top of this cast-bronze branch symbolizes infinity, while simultaneously providing the “head” for the crucifix created by projecting stag’s antlers. 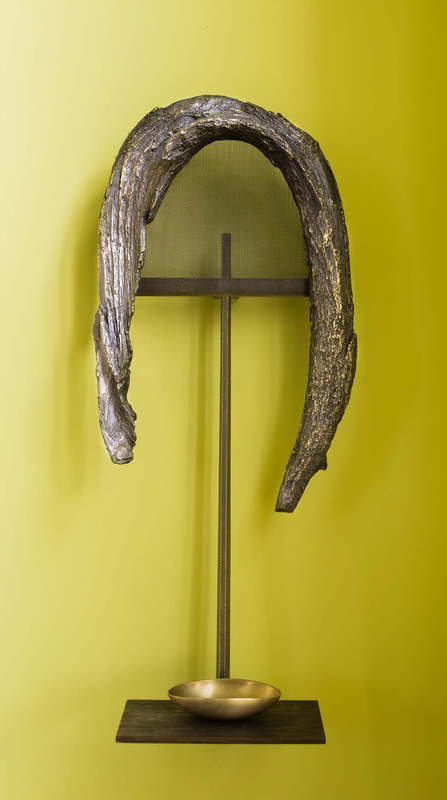 Formally, the antler points allude to the crown of thorns. Functionally, they supply a means of benediction at a service: When dipped into a bowl of blessed water, the points collect droplets that may be cast amid the congregation. Unlike the vertically elongated Roman cross, which it predates, this figure— still widely used in Eastern and Orthodox rites—has four arms of equal length. Before the advent of Christianity, this design symbolized, among other ideas, the four directions of the earth. Later, it became an emblem of the four evangelists and their gospels. 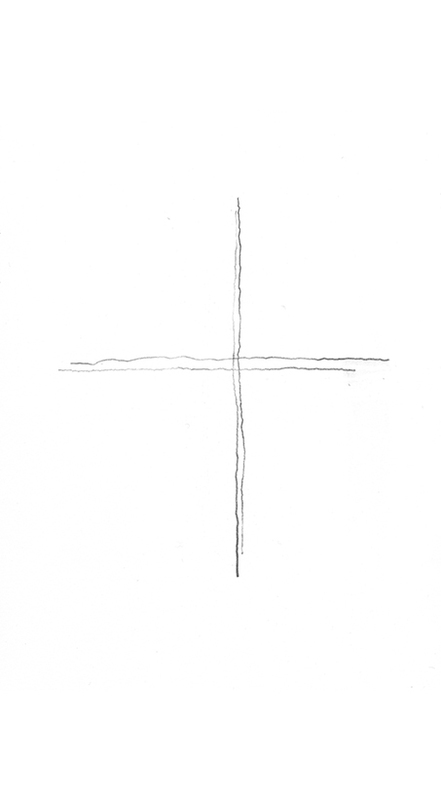 I have hand-drawn an original pencil sketch of this iconic shape inside each copy of X Crosses.